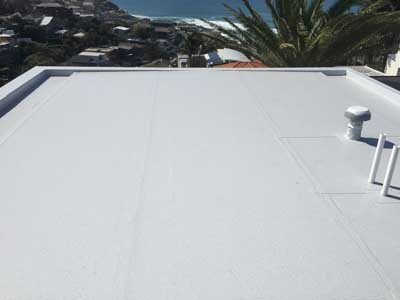 Cosmofin waterproofing system was specified and installed on an exposed rooftop in Bronte to replace the failed liquid membrane. Cosmofin was installed as the preferred waterproofing membrane directly over the failed membrane system, eliminating any need to remove it, thereby saving costs. The building owner had been put through considerable trouble due to the poor initial choice of the liquid membrane waterproofing product. The resulting leakage not only affected the integrity of the structure but also created unnecessary repair costs. With qualities including UV stability, resistance to corrosive and aggressive salt air environments and excellent elongation properties, Cosmofin LLV (fleece backed for adhering) PVC sheet membrane was found to be the ideal solution for this application. For installation, the Cosmofin LLV system was bonded to the roof and terminated with its own stainless steel ancillary components to provide a complete waterproof system. All Class Waterproofing, an experienced Wolfin/Cosmofin waterproofing applicator was engaged to carry out these remedial works. During the course of this project, All Class Waterproofing was hired by the builder working on an adjacent new building to install the Cosmofin waterproofing system on their roof. Projex Group offered advice to the builder and owner regarding the integration of the Cosmofin membrane system with the solar panels and hot water systems that were to be installed on the membraned roof. Cosmofin waterproofing membranes have been used on many installations over the last two decades, providing the assurance of long-term waterproofing and protection to a variety of different substrates. Before undertaking any waterproofing project, it is very important to choose the right membrane and consider the numerous factors that can affect the performance and longevity of the chosen membrane. Key factors to consider include type of substrate, nature of environment, finishes to be installed, and UV stability and movement capability of the membrane. For your next waterproofing project, consult with Projex Group to select a membrane system that is fit for the purpose. Projex Group is the sole Australian agent for Cosmofin Membranes.